By the time the air turns frosty and the radio starts playing "Jingle Bell Rock" on 24-hour repeat, you've probably already caught that holiday entertaining bug. And your living room is the center of the action, where you while away the hours beside a fire with friends and family. So when it comes to Christmas decor, it's no surprise that you'll want your living room to be the highlight of the house. Checking out other gorgeous living rooms decorated for Christmas is a great way to get inspired and consider how to deck your halls this year. This living room from Kellynan Blog is simple, elegant and sophisticated. It's subtle, with most of the focus on the wide banister, but no less cheerful for it. If you want to break from tradition this year, consider drawing inspiration from this amazing room by Sugar and Cloth. The whimsical decor is fresh and unique and ditches the standard green and red color scheme. When shopping for Christmas decorations, look for pieces that truly stand out. On the other hand, there's nothing wrong with sticking to tradition when it comes to Christmas decor. This living room from Unskinny Boppy is a cozy and inviting space that makes us want to sip hot cocoa over a fire. Incorporate your room's existing elements when decorating for the holidays—in this case, the fireplace and rustic coffee table fit right in with the rest of the room's decor. There's a reason monochromatic decor schemes are so popular: They can be easy to employ and they look effortlessly classy. Blogger Craftberry Bush channeled freshly fallen snow in this living space. White is a popular color to decorate with for Christmas because it makes every ​ feel clean, airy and bright. Decorating your living room for the holidays doesn't have to be a massive undertaking. Check out this space from Our Sixth House, which features functional decor that feels festive but doesn't overpower the room. If you aren't interested in creating a winter wonderland, stick to the basics: a Christmas tree, some garland and maybe a few cozy candles. The holidays can be a great time to show off your crafty side. This cute woven tapestry from Everything Emily easily becomes the centerpiece of any holiday decor. And with a tree this cute, you don't even need a real one. Speaking of, there are many ways to DIY your Christmas tree that both fun and unique. The saying "don't ruin a good thing" is especially true when it comes to home decor. The Christmas decor in this room from A Burst of Beautiful is stunning, but it doesn't feel forced or out of place with the rest of the space's decor. Keep your Christmas decor in line with the rest of your color palette (even if it's not a traditional holiday color) for a more fluid feel. When decorating your living space for Christmas, it's crucial to consider the size of your space. This room from Designing Vibes has high, sloped ceilings so the decorator picked a Christmas tree that's tall enough to stand proud. Whatever kind of space you have, make sure your Christmas tree is in proportion with the rest of the room, so you don't start to feel like an elf (or a giant) standing next to it. Can you believe this living room from Mountain Modern Life is actually in an RV? Whether it's an apartment, a house, a dorm room—or yes, even an RV—there's a way to decorate your space for the holidays. Again, work with the natural elements of the room to come up with a decor scheme. In this case, we love the outdoors-y feel of this Christmas decor. There's never a bad time to play with metallics, but Christmas is definitely a great one. This frosty living room from Driven By Decor uses golds and silvers to add a bit of seasonal glam. If you tend to be reserved when it comes to your decor, the holidays are ideal for pushing your boundaries and add a little extra sparkle. The holidays are a time for joy—so if you can find decor that makes you smile, you're doing it right. This little living room from Hello Little House is incredibly cute, and though it's not overly decorated, the banner adds a whimsical touch that just feels happy. If you are drawn to the modern Scandinavian aesthetic, you'll love this living room from Jeanne Oliver. The minimalistic look and neutral color palette draw a stark contrast with traditional bright Christmas colors and wild decor. 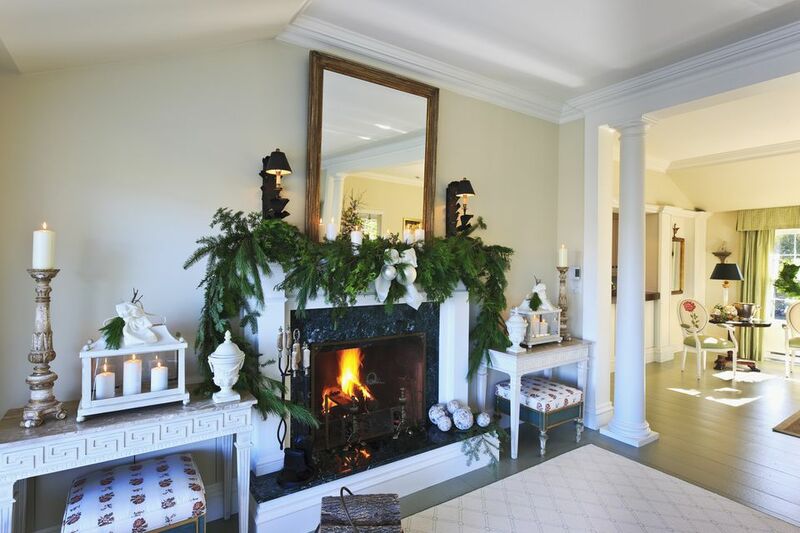 Christmas is naturally nostalgic, so why not incorporate some vintage elements into your decor? The living room pictured from Deeply Southern Home's home tour is Americana to the core, and the vintage sled and American flag give it a distinct personalized touch. One of the best things about Christmas decor is that it can exist simply for its own sake. If you tend to feel like everything in your home should have a purpose, the holidays are the excuse you need to decorate just because. This lovely little Christmas display from Nina Hendrick is the perfect inspiration to create your own little nook in your living room and fill it with your favorite Christmas decor. No mantel? No problem. We love how blogger Keys to Inspiration used a modern wooden ladder to display stockings. It's a great way to use up a little dead space and looks as festive as a fireplace. This rustic living room from Coastal Cham draws upon elements of farmhouse and vintage style to create an incredibly inviting space. 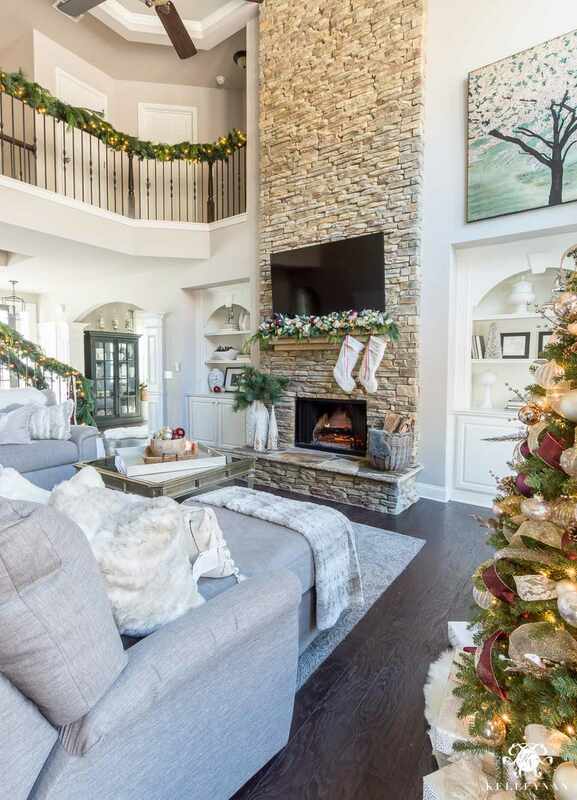 We love the frosted Christmas tree and sprigs of evergreen purposefully laid around ​the room. This room from The Wicker House is proof that Christmas decor can be black and white and still look beautifully festive. And understated doesn't mean under-decorated—embrace Scandinavian style and keep your decor look streamlined and simple by sticking to one or two main colors, and avoid flooding the space with knickknacks. This living room from Decor Gold Designs screams fancy cocktail party in the best way. The main focal point is the gilded Christmas tree, but it's loud and beautiful enough to carry the whole room. You probably spend the most time on your couch, so why not deck it out for the holidays? We love this look from The Design Twins, which instantly puts us in that spend-a-whole-day-on-the-couch frame of mind. Become a pro at the art of arranging throw pillows, and your guests may tussle over who gets to sit on the couch during your next Christmas party. Though Christmas may bring to mind snow and freezing temperatures, this coastal-inspired living room from The Creativity Exchange feels like a wonderful reprieve from the chilly season. The soft blues feel like a little vacation, but don't detract from the charm of the room.